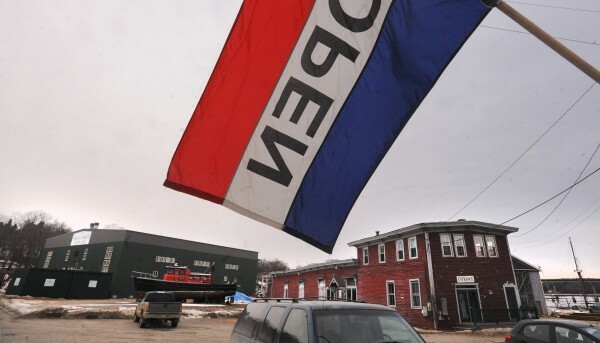 The Front Street Shipyard, which employs roughly 110 people in Belfast, was the first stop on a tour Monday for members of the Joint Select Committee on Maine’s Workforce and Economic Future, who were interested to learn more about Belfast's recent revitalization. BELFAST, Maine — State legislators came to Belfast on Monday to find out what is working in the midcoast city, which is enjoying a period of downtown revitalization. Members of the Joint Select Committee on Maine’s Workforce and Economic Future first toured the Front Street Shipyard, a major new employer that has put down roots on the waterfront. They then went to the University of Maine’s Hutchinson Center for a panel discussion and public hearing to gather information on how to create thriving downtowns, with the intention of helping other communities around the state do so. Panelist Mike Hurley, a city councilor and local businessman, said that during a time of high unemployment in Belfast 30 years ago, if there were two cars parked on Main Street on a Saturday afternoon, it was unusual. Things have really changed since then, he told the lawmakers. The 15-member bipartisan committee was created this session in part to address the “skills gap” that inhibits Maine employers’ efforts to recruit properly trained workers. “We also know that there is a key intersection between downtown revitalization growing businesses and jobs and workforce development,” Sen. Seth Goodall, D-Richmond, said after the panel discussion and public hearing had ended. Earlier in the day, committee members took a tour of Front Street Shipyard, which in the last two years has grown to employ 110 people and has become what Hurley termed a “supercharger” for the Belfast economy. “It’s a great success story that needs to be replicated,” Goodall said. Panelist JB Turner, the shipyard’s president and general manager, told committee members that the city’s willingness to collaborate with the company really allowed it to move fast and open quickly. Several panelists spoke of the need for robust public-private partnerships to allow communities to rehabilitate their downtowns, many of which were pummeled by urban renewal efforts in the 1960s and 1970s. They also mentioned the importance of having reliable funding sources, especially for communities that are service centers. Bangor Mayor Nelson Durgin described his service-center city as an economic engine for nearly two-thirds of Maine. He said that downtown Bangor’s attractiveness to a growing number of people is directly tied to the activities they can do there — including the arts, the theater, library workshops and a network of trails that are close to the city center. He pointed out the renewal on the waterfront, the concerts and events that are bringing large numbers of people to the downtown, the new auditorium, the refurbishment of the former Freese’s building and more. “All this was done with public-private cooperation,” he said.